Finding the perfect balance between academics and athletics has always been a top priority for student Kayla Wood. Attending Castleton not only provided her the opportunity for educational growth, but allowed for advancement in her athletic abilities as well. The Physical Education major, with a minor in School Health Education, has been an active member of the Softball team since her freshman year, with a variety of accomplishments both on and off the field. Her passion has led her to pursuit a career in health and fitness, with a desire to promote a healthy way of living. “I want to teach others from a young age the importance of health and living a fit, active lifestyle,” said Wood. During her time at Castleton, Wood has been an active community member. 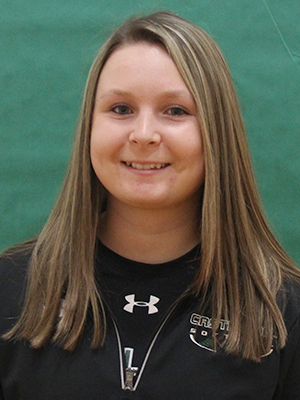 She participated in Castleton’s Mentoring Program, attended different service events with the Softball team, and has even helped with community projects that include working with local students to make blankets for cancer patients.